There's a certain October holiday that is a favorite of many kids. And over the years, Teresa and Paul Jennings have had a lot of fun writing some nifty, "creepy" songs. 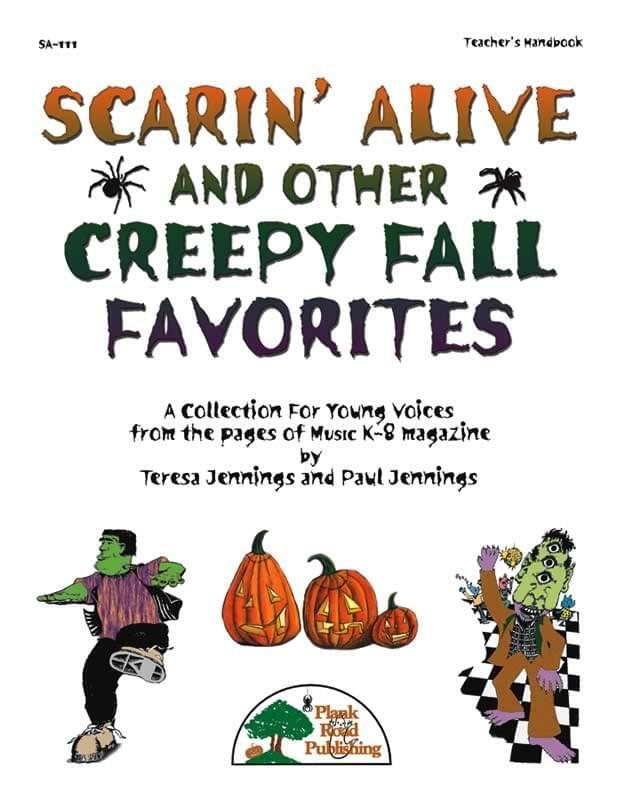 But the really great thing about this collection from the pages of Music K-8 magazine is that while these songs sometimes hint at Halloween, most of them never actually mention it. So you can use them for any number of occasions! Who says spooky songs can only be sung in October? Scarin' Alive - Imitating a well-known disco-era favorite, this song parodies the familiar background, melody, and rhythm very closely. If you were around back in the days of disco, you will be instantly amused by this tune. Bat Dance - This song is purely for the fun of it! It has a funky beat that your students will really get into. And, of course, they'll have a great time coming up with their own "Bat Dance." The Sounds Of The Night - This simple rock song is designed as both an exercise in rhythm and an opportunity to use body percussion. It makes for good training for keeping parts on track while other parts are also being performed. Pumpkin Jack - This quick and easy swing tune is just the ticket for singing about that "scary" season without ever actually mentioning Halloween. On the other hand, it offers a little bit of spooky fun through the use of seasonal sound effects, that your students get to create themselves. Do The Igor - Anyone who is familiar with the old black and white movies about Dr. Frankenstein, his sidekick Igor, and their Transylvanian escapades will appreciate this very tongue-in-cheek piece. In this song, a disco beat, a pipe organ, and a lot of cool sci-fi sound effects combine to create the perfect setting. Scarecrow - The song "Scarecrow" has a steady rock beat that no child can resist. It's also perfect for studying various elements of music, like rhythm and dynamics. Of course, your singers will probably enjoy singing it just for fun because it gives them the opportunity to ad lib some "scarecrow" noises and movement. Rattling Bones - "Rattling Bones" allows your students a chance to practice their dynamics, their reading of sixteenth notes, and their use of non-pitched percussion. And it does have that certain seasonal "eery" quality. But here again, there's no mention of Halloween. And since skeletons and bones tie into science (biology), you could even have a little across-the-curriculum study, too. Gruesome Groaners - This gruesome, pun-filled tune is set in a medium swing style, with acoustic bass and lots of dissonant jazzy winds. We've even thrown in a jazz theremin to give it that authentic seasonal flavor. The instrumental tracks are lots of fun to listen to all by themselves, though we know that your students will probably be more interested in getting to the silly jokes and sound effects. About the Convenience Combo Kit The Convenience Combo Kit includes both the Kit with CD and the Downloadable Kit.